Orange County is arguably California’s most well known county and is definitely one of the most visited areas of the state. Orange County is mostly suburban with lots of things to see and do for tourists and locals alike. This county is home to attractions such as Knott’s Berry Farm and of course Disneyland. One of the things that makes Orange County an great place to visit is the fact that it is not only an awesome place for those on vacation but also offers quite a lot to the business travelers as well. The Orange County Convention Center is one of the busiest in the world and is home to many large fortune 500 corporations and is a stone’s throw away from Silicone Valley. Orange County is an incredible place to visit where visitors from all walks of life are guaranteed lots of fun and enjoyment. Orange County John Wayne Airport is located in the sunny city of Santa Ana, California. Just a hop, skip, and a jump away from Los Angeles and its sunny beaches and movie stars, this airport is convenient and easy to locate. Whether you are looking to share a ride with other passengers or if you’d like to arrange a private ride for you and your group Prime Time Shuttle offers quality service at a great price. Travelers can find SuperShuttle vans are spacious can seat you and your group comfortably. Whether you are traveling by yourself and only need a shared ride van or if you have a medium sized group and need a whole van to yourselves, SuperShuttle can accommodate you. The John Wayne/Orange County Airport, the entryway to the Southern California provides an easy access to Irvine and rest of the Orange County. Less than 40 miles from Los Angeles it is located near Irvine and the popular Newport beach. John Wayne Airport serves as a general aviation airport also. It functions as a location for some flight schools too. You could learn to fly around the area visiting there. While some airports tend to confuse and navigating becomes a problem, SNA operates with only one main passenger terminal which is called the Thomas F. Riley Terminal. A layover of few hours at the Orange County Airport SNA could mean having a good time sight-seeing as it is in close proximity of the city. The John Wayne Airport has two museums within 1 mile of it. The Irvine Museum is on walking distance and the only one in California which is devoted in California Impressionism. The Lyon Air Museum is on the far side of the runways of the airport. They exhibit airplanes, cars, military vehicles essentially belonging to the World War II. Though it is open all week it is wise to call first. Or you could bask the Californian sunshine at the Newport Bay which is less than two miles from SNA. If you are not a shopping person, you could opt for the sky bridge over the east of the South Coast Plaza & explore the view of the city. John Wayne Airport gets its iconic name from the famous western actor, but the moderately sized facility is also famous for being located in the heart of California’s famous Orange County. Get there by booking a shared ride van with providers such as SuperShuttle, both of which offer safe and reliable transportation to just about anywhere in the greater Orange County area, whether it’s your hotel or a famous attraction. Be sure to call ahead of time to make sure you’re transported on time and to also take advantage of potential savings. Orange County is home to the quaint, but charming Knott’s Berry Farm, an old-school theme park with simple rides made perfect for growing families. If you’ve got more than a few children that need entertaining, be sure to leave enough room by reserving a private van from area shuttle providers, heading off to awesome landmarks like the Pretend City Children’s Museum. Host to imaginary towns and interactive exhibits, the museum is something that just about anyone could admire. Go for an intimate walk on the beach at Bolsa Chica State Beach, a beautiful recreational area that’s home to world famous sunsets that make the small entrance-fee priceless. Arrive and leave in peace by rewarding yourself the luxury of a private sedan, contacting local transportation services ahead of time for a reservation, both companies offering unique vehicles for unique tastes. Although many see Orange County as a huge party city, it’s also one of the most family-friendly places on earth. This is especially true with the presence of Walt Disney’s first amusement park, Disneyland. Spend a day at the original magic kingdom by booking a private SUV for the group, arriving to the 8 themed lands in unmatched safety and comfort. You can get your vehicle through our area companies, taking a smooth ride to other iconic hotspots like Disney California Adventure. Arrive to your 5-star suite by showing up in appropriate style. You can do this by booking a stretched limousine and allowing you to enjoy your upscale residency as much as you’ll enjoy Orange County’s nightlife. When the sun’s gone down, have your chauffeur take you to The Hobbit, a polished eatery that offers French dining in one of the most luxurious settings in all of California, not to mention an incredible wine menu. If you’ve got a large group looking to get around town, you’ll be happy to hear that Orange County is highly accommodating. Reserve a chartered bus for your travels and spend the day shopping at Fashion Island, an upscale shopping plaza that looks out at the beautiful Newport Beach. If you’re looking for a more charming time, visit Balboa Fun Zone, a seaside amusement park that gives Disneyland a run for its money. 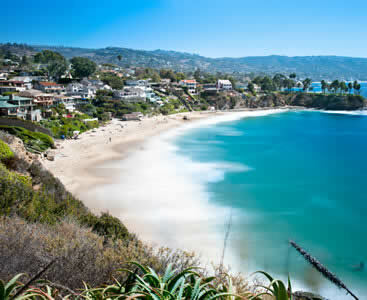 Orange County’s exquisite location along the California coast makes it an extremely popular tourist destination. Its south-western side borders the Pacific Ocean making it home to some rather incredible beaches. The area also boasts a mild climate that makes it a hub for surfing as well as beach volleyball. → West Jetty view Park is popular amongst locals. It is a charming smaller beach with lots of character and excellent surfing. → Balboa Beach is another popular beach in the area. It is home to the Balboa Fun Zone which has a Ferris wheel, canoe and kayak rentals, arcades and even an Aquarium. This is a place the whole family will enjoy. Another wonderful destination that is certainly worth trying out during your trip to Orange County is Crystal Cove State Park. The sandy beaches and tide pools that are found in the Crystal Cove make it an exciting and enjoyable place to visit. The wooded canyons, ridges and gently sloping hills here promote the feeling of not being in an urban setting without having to go very far. → There is an offshore underwater area within the park’s beaches, which provides a haven for outdoor sporting activities. → Recreational opportunities are diverse at the Crystal Cove State Park from tide pool walks, to guided hikes and even geology talks. Make sure to find out which activities you are interested in before you head out to the park. It is no wonder why Disneyland is known as the happiest place on earth. 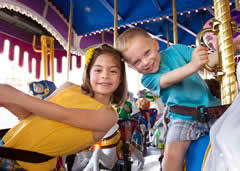 Disneyland is made up of two parks; Disneyland Park and Disneyland California Adventure Park. Disneyland California was the first theme park commissioned by Walt Disney and the only one he oversaw the construction of. The Disneyland Park is made up of several different "lands". These lands are Adventureland, Fantasyland, Tomorrowland, Frontierland, Main Street USA, Critter County, Mickey’s Toontown and New Orleans Square. Each of these lands has its own distinct flavor and is decorated to reflect the spirit of the attractions within it. → Adventureland is well crafted to recreate the exotic ambience of a tropical region. Some of the attractions that you can check out during your visit to Adventureland include The Temple of the Forbidden Eye, the Jungle Cruise, Tarzan’s Treehouse and several other exciting palaces. → The setting of Fantasyland is meant to inspire a fairytale setting. If incorporates elements of many popular Disney movies. Its attractions include the Mad Tea Party, King Arthur’s Carousel, the Matterhorn Bobsleds and many more.